Discussion in 'Streetwear and Denim' started by zenmarket, Feb 14, 2016. Happy Monday all! Today I'm here with something a little different. Kimonos! Kimonos seem intimidating, but Y&SONS are here to change that. They're creating bespoke kimonos perfect for everyday wear, and we want to highlight some of their products, which we're big fans of. What do you guys think? Are these something you would wear for your everyday? Shop your favourite Japanese menswear brands with ZenMarket! We are a Japan shopping proxy service that allows you to shop hundreds of online Japanese retailers and have them shipped right to your doorstep. Have you guys seen the latest BAPE collaboration? They're teamed up with Seiko to release a Japan-exclusive divers watch. 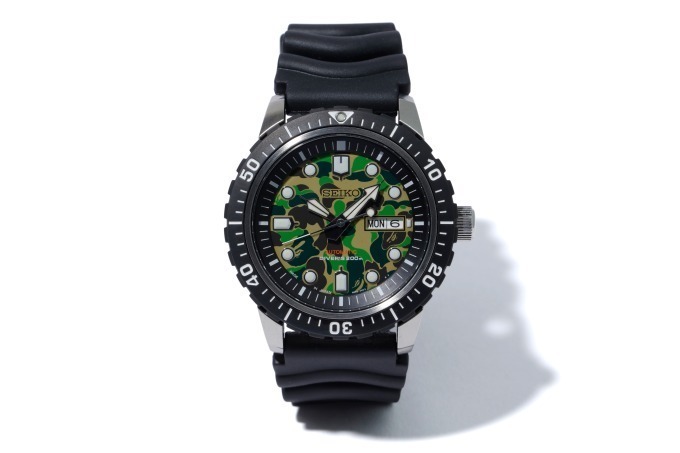 It features BAPE's distinctive camo pattern on the watch face. It is set to be released in just a few days on February 9th in BAPE stores and on the BAPE webstore on ZOZOTOWN. There currently isn't news about retail price yet, but we'll update this post if we hear anything! What do you guys think? Is this a collab you'll pick up? Hey all! We've often said you can find cheaper, and sometimes rare, items on Yahoo Auctions. We wanted to make sure you all were able to get in on some of these great deals, so we’re making a quick tutorial for everyone! If you know what you want, you can use our search function. Make sure you are on the “Yahoo Auctions” tab. Pro tip: If you are able to, try using Google to find the brand names in Japanese, or finding the item name in Japanese. For e.g. I googled “Yohji Yamamoto” to input the above. If you just want to browse items to buy, you can also just click on “Yahoo Auctions” on our main page and be led to our landing page, where there are tons of categories to choose from, including Men’s Fashion! You can also use the topbar to easily navigate through dozens of different categories. On the product page, you can further filter the item by price, time limit, condition and more. You can also find out more information about the item, such as the buyout price, the number of bids currently placed, and how much time before the auction ends. You also have the option to add the item to your watchlist, if you are not yet ready to buy it. Please check when the auction ends, as you have to ensure you have enough time to add funds to your account to place the auction. If there are a lot of bids, it might be harder to win the auction, so this is something to take note of. Please check the seller reviews! We do not recommend that you place a bid for an item if the seller has more than 10% negative reviews. Domestic shipping costs are borne by you, so please double check this. Some sellers will charge VAT (extra 8% of the item charge). This are usually indicated in the description, so please check this as well. Please note that the item description is automatically translated into English, so if you have any questions or doubts, we strongly encourage you to contact us through “Ask a question about this item”. Once you have checked everything and determined that you want to bid, you have to decide what type of bid you want. Automatic bid: This is set based on the maximum bid you have indicated. The price will keep increasing automatically from the minimum increment as soon as you have been overbid. If the maximum bid is reached, you are automatically refunded. Sniper bid: A sniper bid is an auto-bid placed within 5 - 6 minutes before the end of an auction in the case of automatic extensions, and 2 - 1 minute in the case of classic bids. Some Yahoo bids have an automatic 5-minute extension, which you can see on the item page (“Automatic Extend: Yes/No”) for when someone tries to place a sniper bid at the last minute. The bid price will increase according to the minimum increment set. If there are equal bids between several bidders, the first bidder wins. At the end of the auction, you will receive an email from us letting you know if you have been successful in winning! We hope this has been useful in helping you. If you need any help or clarification, don’t hesitate to reach out. Any outdoors fans here? atmos’s latest collaboration with Columbia sounds like it might just be perfect for you! Featuring atmos’ classic plaid design, there are three jackets and a pair of shorts in this collection. The SAWTOOTH jacket and shorts can be easily be folded up into a pouch, which means they are perfect for you to bring on-the-go for camping, trekking, or just in case of emergencies. If that doesn’t matter to you, then the PAVLOF ROAD jacket might be better-suited to your needs. Nepenthes, the parent brand of streetwear labels Needles and Engineered Garments, is back again with another Trickers collaboration! The "Asymmetric Gibson" is a gorgeous shoe with an asymmetric design. The left foot has a wing tip, while the right foot has a straight tip. The soles are Vibram's MOREFLEX, which is lightweight and offers great cushion support for comfortable walking. It comes in four colors -- two suede colors and two scotch grain colors. Any recommendation on down jacket brands? Really like Kka’s styling but it seems that they’ve moved all production to China. Cheers. For Sale: Junya Watanabe High Top Sneaker (S) PRICE DROP. Hey, thanks for the question! Personally, we really like the North Face Purple Label stuff -- it's not the easiest to get your hands on their stuff (a lot of it new is currently sold out, but you can check the selection here) but you might be able to find some on Yahoo Auctions. It's similar to what North Face offers, obviously, but we find it tends to fit better. Brands like KAPITAL, visvim etc. also do down jackets, but we're not very familiar with how these are, so maybe someone else in this forum can give you more advice on this if they've any experience with it. BAPE's pretty known for their down jackets, if that's your style. We're also into UNIQLO's down jackets. They're actually really great at keeping you warm -- they're not always the most stylish, but very practical. Of course, if anyone else has any thoughts, please let us/OP know! It's almost the weekend! Have you seen visvim’s Indigo Camping Trailer (I.C.T.) SS2019 lookbook? It dropped recently and showcases their new offerings for the upcoming season. Here is a peek at their new collection! What do you guys think? Is there anything you’re looking to grab? We’ve mentioned The North Face Purple Label before, and we’re featuring it here again! You probably know about The North Face, but their Purple Label is Japan-exclusive. It is available in some select retailers outside of the country but is difficult to export due to trademark laws. The Purple Label obviously follows Japanese design philosophies, so if you’ve ever used TNF clothes and wished they looked just a little bit better, then you’re looking at the right brand. Here are some pieces from their upcoming SS2019 collection. How do you guys think the Purple Label stacks up against the normal TNF offerings? Hi folks! We recently wrote an article about 10 Japanese streetwear brands we think people should know about. Do you agree with the list? Did we miss out any brand you absolutely love, or is there a brand you think shouldn’t be on the list? Let us know! Hi Styleforum readers! We're back again with another tutorial. This time, we wanted to help you with ordering from the KAPITAL webshop. We know it's not the easiest to order from websites not in your native language, so we hope this helps you out! Note: You can read this tutorial in a separate webpage here. Step 1: Click here to visit KAPITAL. To make it easier for you to understand the website, we recommend that you use Google Chrome. This will allow you to navigate the website in English by right-clicking and “Translate to English”. Please note that this translation is auto-generated, and is not 100% accurate. Step 2: To search for an item, please use the search field at the top-right of the page. For the best results, we recommend using keywords in Japanese. If you need tips on finding item names in Japanese, you can read our handy guide here. You can also search using the drop-down search bar. These allow you to search by size, color, and material. If you do not want to search, you can just browse the categories up top. Step 3: When browsing through products, you will be able to see basic information about the item, such as the name and the price. If you want, you can also choose to sort the order you are seeing the products, so you can see the cheapest products first etc. Additionally, to make it easier to shop, you can browse other categories up top. Step 4: On the product page, you will see more information about the item. The price (with tax) will be displayed, as well as an item description. You will also find out more about the materials used. If you scroll down, there will be a size chart that will help you make a decision on what size is appropriate for your frame. Step 5: Once you are satisfied and want to buy, it is time for us to help you! There are 3 ways that you can add the item to your ZenMarket cart. On any ZenMarket page, you can easily copy and paste the URL of your item into the search bar. You can also click the + button next to the “My Account” button next to the search bar. Lastly, if you go to this page, you will see a giant “+ Add Item URL to Shopping Cart” link. Step 6: A pop-up window will appear, where you can put the URL (or double-check it, depending on the method you used). Under “Description”, you can include details about your order. It is very important that you let us know the size and color of your item. Please let us know if you found this helpful, and if you would like to see tutorials for other webshops! Glad you found it helpful! Please let us know if there are any other stores that you would like tutorials for. Always happy to help! cav empt recently dropped their SS19 Spring/Summer collection, and we’re super excited to showcase some of our favorites. Would you guys pick up anything from this collection? Or are you holding out for some other drops? Are there any fans of NEIGHBORHOOD here? We love their latest collection and wanted to share some of our favorite looks with you. What do you guys think of the latest collection? Anything that you might pick up?